Celena is passionate about people, words, art, laughing, and traveling. A lover of historical romance, she was inspired to write her newest series when she found something mysterious in her family tree. Hence, the Time and Eternity series was born. You’ll find a dash of romance and fantasy in all of her writing. 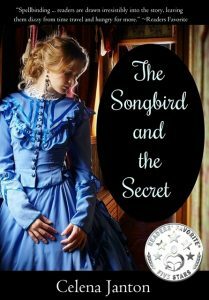 Read The Songbird and the Secret just in time for the release of the next book in the series–a highly-anticipated time travel romance!